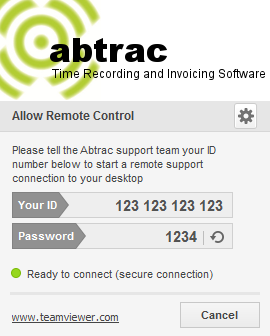 The Abtrac Support team use TeamViewer for remote support sessions. If you are asked to start a remote session you can do so by clicking on the image below. This link enables a one-time only support session. Choose RUN at each of the 3-4 steps when prompted. The download usually takes less than 1 minute to run. Team Viewer will give the support team access to your desktop so we can both view your version of Abtrac together and solve your support request. Once installed please call our free phone support number and give us your ID and password to start a support session.